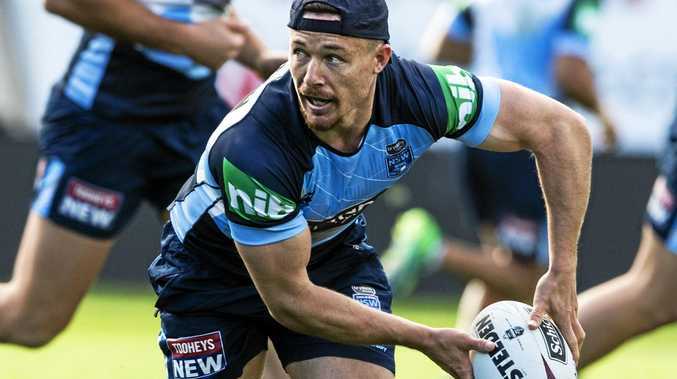 IT doesn't take a genius to work out who the Maroons will target in Origin II after Damien Cook dominated out of dummyhalf in the series opener. A large part of the Blues game plan in Origin I was based around Cook's speed around the ruck and the Blues' backs ability to play off the back of the space that provided. The Maroons have made no secret of the fact they will need to tighten up their defence in the middle and Cook is prepared for some extra attention in Game II. "Hookers and halves are always hunted in attack," Cook said. "We always expect a bit of traffic our way, but I'll still be going out there to play my style of footy. "If I get those chances to run I will try and take them, so I won't be changing anything I do." Cook has welcomed any challenge from Queensland to take his speed out of the game by upping his defensive workload. Damien Cook looks for support. 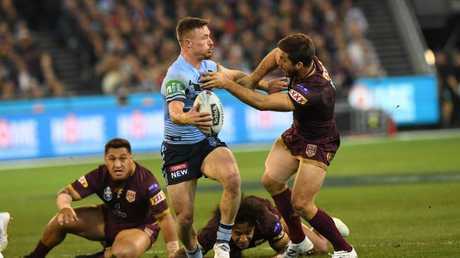 Cook was one of the NSW heroes in Melbourne after cutting the Maroons forwards to shreds with his blistering work at the ruck, including setting up the opening try for James Tedesco. It was yet another confidence-booster in a breakout year for the South Sydney rake. "I've been lucky to play 80 minutes a lot for South Sydney week-in, week-out, so I'm building confidence within the team and myself as well, being able to do that," Cook said. "Obviously Origin is something I've never experienced before so it was a whole different mindset going into that game, but that experience will make me better for round two." 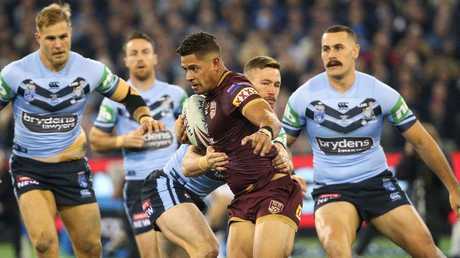 But while he was soundly praised for his contributions in attack, the 26-year- old said he also took plenty of stock out of finishing the night with 53 tackles, missing none. Damien Cook also starred in defence. 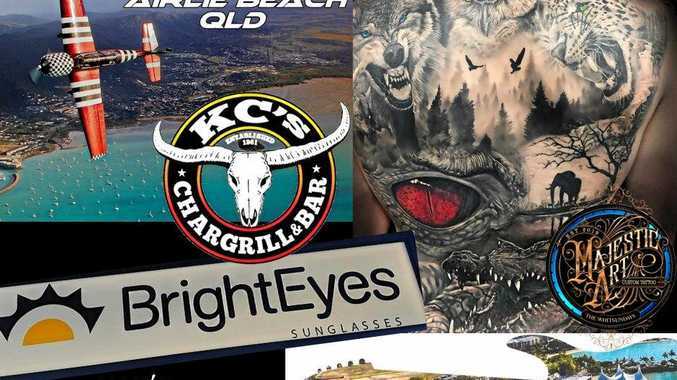 It was just 10 tackles shy of the record set by former NSW captain and Rabbitohs teammate Robbie Farah during his memorable performance in 2012. Cook wouldn't expect anything less than to be more of a target in game two, having been tested on a weekly basis at club level - and passing with flying colours. "It's just smart from other teams. If you're playing South Sydney, are you going to run it at myself, or at Sam, Tom or George (Burgess)?" he said. "The smarter option's to run it into the smaller body. We know we get that traffic in the game, it's just part of the game. We just try do our part in the game in attack, but hold our own in defence." He backed his improvement in fitness to withstand any fiery test from the Maroons. "It's something I've worked hard on in the pre-season and over the last few years, making sure my fitness is up there," Cook said. "Game fitness is a whole different thing, but this year I've been able to play week-in, week-out, 80 minutes at club level and I feel like I can do the 80 minutes fine."